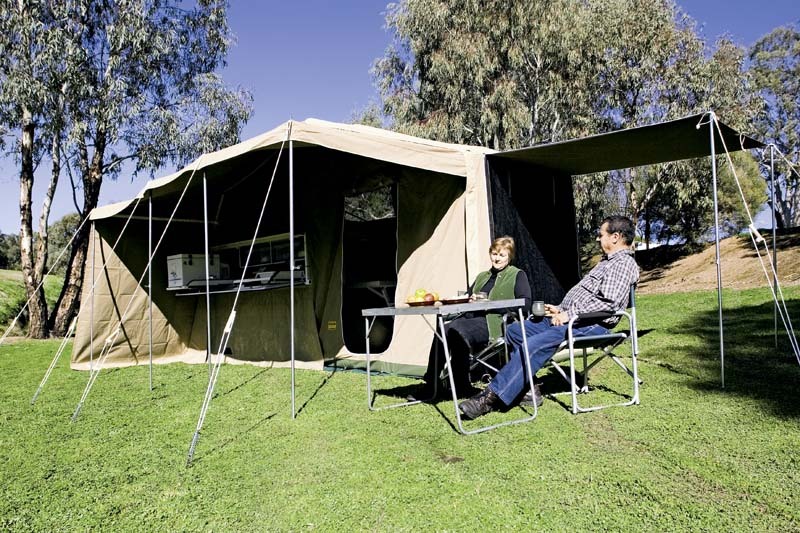 Originally published in Camper Trailer Australia #11, August / September 2007. 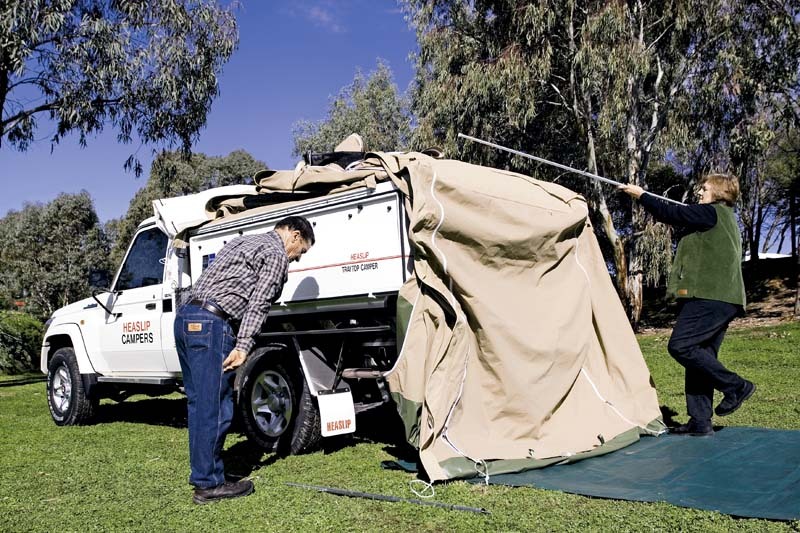 With an increasing number of adventurers eager to explore remote areas, the demand for 'go anywhere' camper trailers is very high. Understandably, there are plenty of rugged, well built trailer options for you to choose from, but it may also be worth considering an alternative to suit your needs. Ever thought about a traytop? No towing to worry about and, as with the Heaslip Traytop, there's plenty of convenience for all your daily needs. This includes a quick and simple method of removing the rig from your ute. 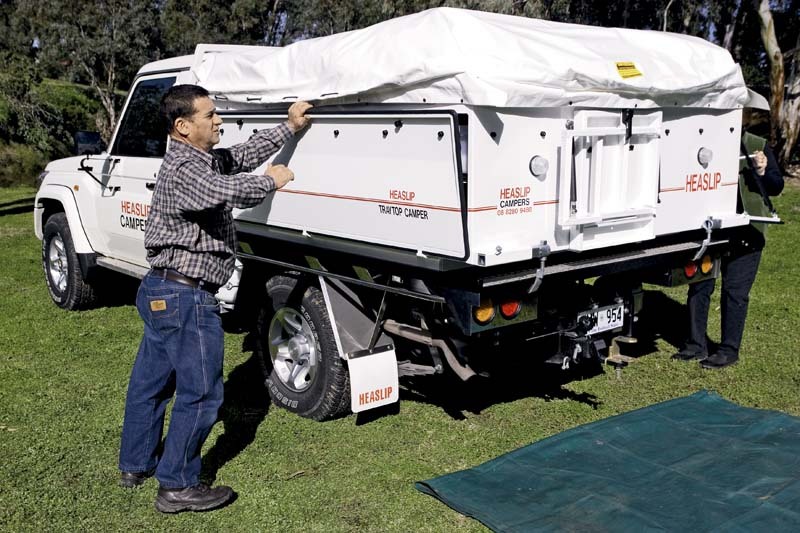 Rob Heaslip is a true camper trailer innovator, with many of his ideas now commonly found on many of his competitors' offerings. An enthusiast who employs a lot of commonsense and experience to his campers, Rob's SA family business gives the impression that it's not out there to make the most profit, but rather to build traytops how it wants to and for sensible money. To this end, it is nice to see a product such as the Heaslip Traytop, which is over-engineered, if anything. The well thought-out design provides you with confidence that it would serve you well on a long and demanding journey. The Heaslip Traytop design is now 11 years old, so Rob and his family have been refining and updating the all-steel product to suit customer needs over a long period, suggesting there should be no niggling problems to deal with. Combine that with a cosy kitchen, ample storage and user friendly tent area and there is a lot to like here. The beauty of traytops is they are basically a slide-on for a tray truck and, in the Heaslip's case, it's designed to fit any one-tonne flat tray single cab or king cab model. So, if your vehicle changes, the Heaslip can be easily transferred between the two with no alterations. The product can also be fitted to one of Heaslip's 6ft x 4ft (1.8m x 1.2m) purpose-built steel trailers if desired, while there is a traytop of different dimensions available for double cab utes as well. Our test Heaslip Traytop was fitted to a brand new Toyota LandCruiser LC 70 and, when mated, they are a formidable pair, happy to be tested in extreme locations. During our test, Rob kindly threw the LC 70 up and down whatever gradients we could find to illustrate how sturdy and secure the equipment is. This element of the test was passed with ease: the Heaslip Traytop didn't shift at all. The kitchen area can be open for business in no time. It includes a roll-out two-burner cooktop, fridge and roll-out food preparation tray with wash bowl. All lock into position with minimum fuss. A water tap can easily be swivelled into position, while four 28L sliding drawers offer ample storage for food, crockery and cutlery. Other notable inclusions are the Supercharge all-rounder 105Ah battery, Engel 12V fridge socket, two 12V lights, one 12V portable fluoro light, three auxiliary sockets, and a fire extinguisher. 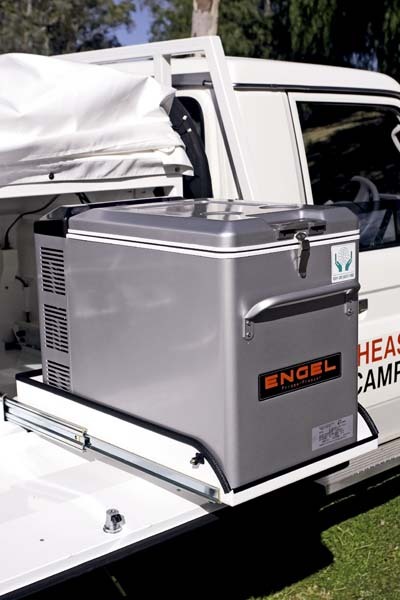 A 65L fresh water tank is mounted behind the fridge, ensuring the combined weights of these are ahead of the rear axle so as not to disrupt the vehicle's handling. 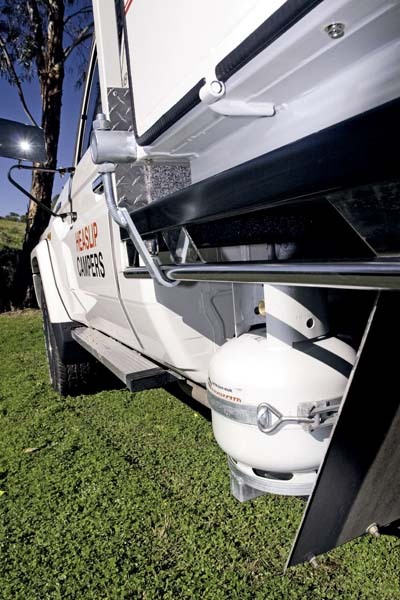 A well secured 4kg gas bottle is mounted between the back of the cab and the wheel's mudguard and this attaches to the stove with a removable hose. This is a handy safety feature; there is no way of shutting the kitchen's door without disconnecting the gas hose first. haul your equipment. This area is vital as there is next to no storage space in a ute compared to the back of a 4WD towing a camper trailer. This storage area is as quickly accessible as the kitchen area and there is space for an extra fridge/freezer (as in our test model), alongside another 12V fridge socket, 12V light and 12V Exide Extreme battery in a battery box. When it comes to setting up the sleeping and living quarters, there is a knack to it that takes a bit of experience to master. 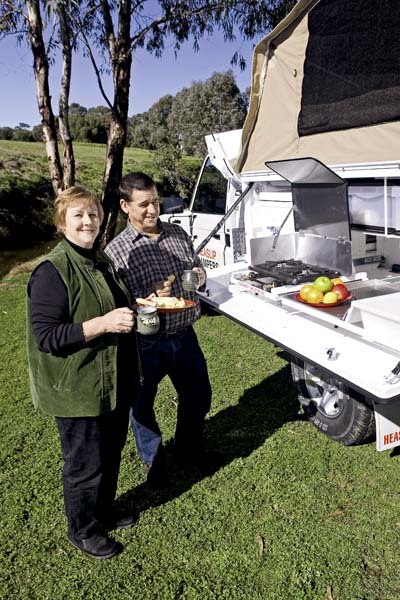 With the Heaslip Traytop, Rob offers a very useful DVD that guides you through the procedure - it looks easy when he does it with the help of his partner, Judy, so once you get the hang of it, the whole tent area can be erected in very little time. One of the benefits of the Heaslip Traytop is the low height of the entire rig. Not only is this great for fuel economy and getting into the likes of a multi-storey car park (it's not all bush travel, after all), but you also don't have to climb all over it when setting up. Two people can fold the tent back quickly and easily from the Traytop; sturdy poles are in soon after and, handily enough, the bed is already made for you. The queen size mattress is of high quality and very comfy, there's storage around its sides and it has handy light switches and an auxiliary socket. The 6ft x 9ft (1.8m x 2.7m) floor area in the tent is bright inside, with two mesh doors, three windows around the bed and huge mesh wall, all secured with quality YKK zips. 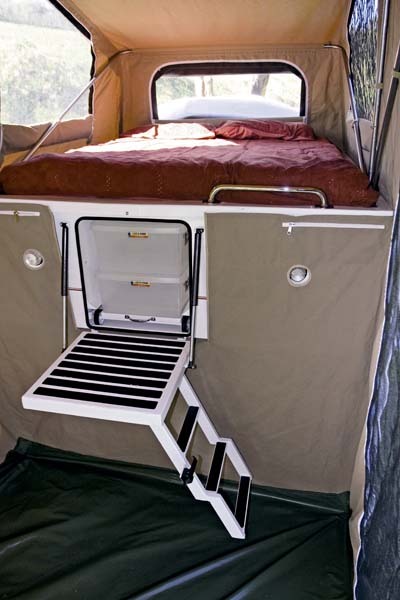 A real boon is the access ladder up to the well-elevated bed. Instead of the usual lightweight ladder or box, an integrated set of steps fold down on gas struts that are solid and safe. 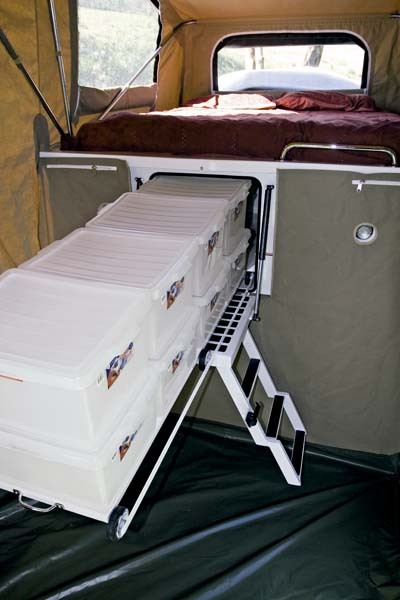 A nice platform at the top ensures an easy passage on and off the bed. With the steps folded down, a roll-out wardrobe is accessible, adding eight more 28L compartments of dust-free storage for clothes or other equipment. If you'll be spending a bit of time outside, the back flap of the tent is a quick way of putting a small awning up. If you're planning a longer stay, or need more space under cover, the main awning can be zipped on over the kitchen area and beyond. Setting this up looked a bit fiddly at first, but Rob and Judy breezed through it, indicating again how easy it is with a bit of experience. The Heaslip Traytop comes with a useful draft curtain for the side to stop wind blowing around your legs while using the kitchen and, when used with the provided end wall canvas, you can create a weatherproof, wind-protected area. A complete annexe is available to effectively double the living area as a cost option and Heaslip can also offer protective floor matting, shower tents and change shelters according to your needs. Of great appeal is the option of being able to remove the Heaslip Traytop from your vehicle in a matter of minutes. That is ideal if you want to leave your camp set up and head off to explore or get supplies. plus for the setup. Four leg jacks (each rated to 1364kg) are found in the storage area and need only travel with you if you're sure you'll need them. Fitting them to the jack mounts isn't too time consuming and, with two people on the job, the Heaslip Traytop can be raised simply and the vehicle driven out from underneath. Then it is a matter of lowering the unit to normal tray height again and all areas are perfectly accessible once again. If the idea of towing a camper trailer doesn't appeal, or if you have a ute you are keen to take on an adventure, a traytop might be the way to go. 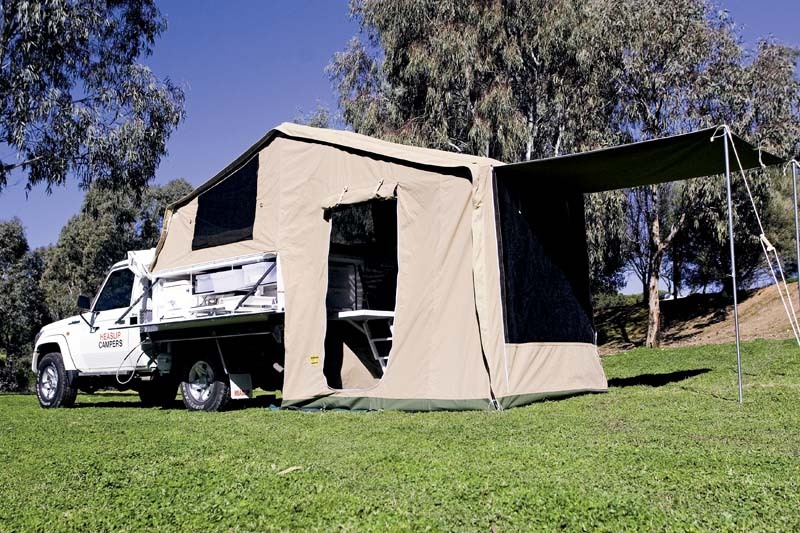 Heaslip's Traytop camper offers the quality and ruggedness many demand, with everything there for most excursions, to be enjoyed in comfort no matter what the landscape throws at you. With the price for our Heaslip Traytop as tested coming in at about $26,000, you can't fault the price, either. Thanks to Gawler Caravan Park, SA, for allowing us use of its grounds for photography, (08) 8522 3805. Find Heaslip campers for sale.